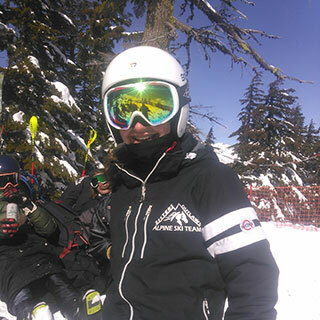 The Sisters High School ski squad competed in the season finals, on Cliffhanger run at Mt. Bachelor on Friday and Saturday, March 1-2. Conditions were difficult for Friday's slalom race, due to the large amount of new snow that fell earlier in the week.There was only time for one race due to the deep ruts and a problem with the timing system. The boys varsity team finished fourth in the final slalom with a team time of 3:04.22, behind Mt. View with a time of 2:59.74. George Chladek led the Outlaws with ninth place and a time of 00:58.55. "George has been working on his slalom game for three years now and he's a pretty good slalom technician now," said Coach Gabe Chladek. Colton Seymour finished 14th (1:01.25), Evan Palmer 20th (1:04.42), Mitchell Griffin 28th (1:07.07), Simon Rhett 33rd (1:10.72), and Kincaid Smeltzer (2:13.33). "The boys skied hard, but had some hiccup due to very rough course conditions," said Chladek. "Kincaid pushed very hard at the top of the course, but crashed twice, and in one run there's no way to come back." The girls varsity squad took sixth with a team time of 3:37.90, just behind Corvallis who had a time of 3:37.17. Hollie Lewis skied a fantastic run for the Outlaws and finished with a time of 1:08.98, which was good enough to put her on the podium at the final awards assembly. "It's a big accomplishment for a freshman, since it's usually juniors and seniors that make it to the podium," said Chladek. "Hollie's technique is clean and she's not afraid to ski the course as fast as she can." The rest of the Lady Outlaws skied solid runs as well, and held the team's mid-pack spot. Times were: Skylar Wilkins 28th (1:14.91), Sydney Wilkins 30th (1:15.12), and Piper Adelt 35th (1:20.30). The boys JV squad took third on Friday with a team time of 4:00.92, behind Bend who had a time of 3:48.83. The finish order was: Christopher Lundgren 43rd (1:14.51), Caden Mercer 56th (1:21.41), Conner Petke 57th (1:25.00), and Jacob Lee 62nd (1:40.22). Ian Cash gave it a great try, but crashed twice and was unable to finish. "This young group of boys stepped up and gave it a good try on very rough course conditions," said Chladek. Smeltzer was fourth with a time of 2:23.36, and Chladek commented that Kincaid had an outstanding day for his final high school race as a senior. The remaining Outlaws' times were: Colton Seymour 10th (2:26.65), Evan Palmer 13th (2:28.25), George Chladek 14th (2:28.57), Griffin 24th (2:36.15), Rhett 38th (2:42.54), Lundgren 41st (2:44.38), Petke 55th (3:01.84), Mercer 59th (3:07.17), and Lee 61st (3:11.65). "Overall for the season, the boys varsity squad finished fourth, a move up from fifth place last season," said Chladek. "The girls finished fifth, an amazing performance for a team of three freshmen and one sophomore. This young team is headed for greatness as they go forward. The boys JV finished strong and gained a lot of experience this season. Some of them will make great varsity racers in the future. It was really impressive to see so many Sisters racers on the podium (Lewis, Chladek, Seymour, Palmer, and Smeltzer) at the end of the season. It's been a rewarding experience this season. I think the coolest thing about this team is the cohesiveness of the group. They all became friends and did an amazing job of supporting each other."